We made two thousand kilometers linking Lake Victoria and the Indian Ocean on our bicycles a few days before planned arrival. 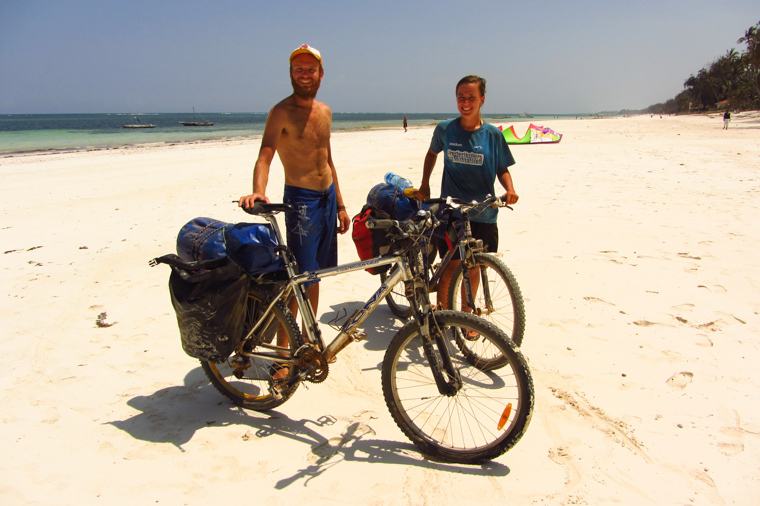 Now we can use some time to cycle around Diani Beach area, bathe, snorkel and watch sunrises over the ocean. One day we visit Raptile Center, a private facility for breeding reptiles and amphibians led by a guy named Steve. Steve shows us his snakes, some of them he takes out of the cage and puts them at our hands, while the other snakes he only dares to tease with a stick. He assures that the snake I am about to hold is not venomous, by saying “semi-poisnonous, no problem”. Although he resembles some kind of a madman, he seems to be trustworthy. After a few such entertaining days we realize that we still have to reach Mombasa. Soon we will have to face the most difficult part of our trip: crossing the civilized part of Kenya, full of cars, buses, malls, white people and shops. Entirely different world. We leave well-maintained beaches and get to the slums full of garbage in Mombasa’s suburbs. We take a completely crowded Likoni Ferry linking Mombasa with mainland. In the meantime we visit the Old Town, then we stop at a Somali restaurant for a lamb with canjeero (a flatbread similar to Ethiopian injera made of teff flour). The east coast of Kenya, especially Mombasa, is a blend of several cultures. Saharan Africa, the immigrant population of the Arabian peninsula, the Western civilization and Arabs from the Swahili tribe originating from the Horn of Africa. The latter one is the tribe which gave rise to the kishwahili language functioning in several countries of the region. It is also the official language in Uganda, Kenya, Tanzania and the Democratic Republic of Congo. We arrive at Shanzu and stop for a few nights at Hebron and Prudence’s place, a couple we get to know by Couch Surfing. Here we observe and follow the presidential election atmosphere. Besides, we get to know the daily life of a Kenyan family and emotional moods associated with elections that absorb everyone, including us. The political campaigns which seem to be more of a music festival than an election rally are coming to an end. The atmosphere and tensions are high on the election day and it persists for several days, as a result of unplanned delays and emerging conspiracy theories. We all look forward to a peaceful and democratic end of this chapter of Kenya’s history. Just before leaving the continent, we manage to find an Italian living in Kenya who agrees to buy our bikes for himself and his wife. Despite the sentimental attachment we decide that our two bikes deserve peaceful retirement in Africa. To put all these thousands of happy, colorful and vivid experiences shortly I will say: I love Africa!